This is really useful and multifunctional addition that can help many players in the game process. You can use the convenient and simple interface, which will help you to quickly change the language in the application, open the mini-map to determine the coordinates of the character. Also, you can create a point of teleportation. By installing this mod, you can at any time to create a point and teleport to this place :). To create a point you must click on the button «W», then «Create waypoint» and enter the name of the point. After the press «Ok» and create a point. 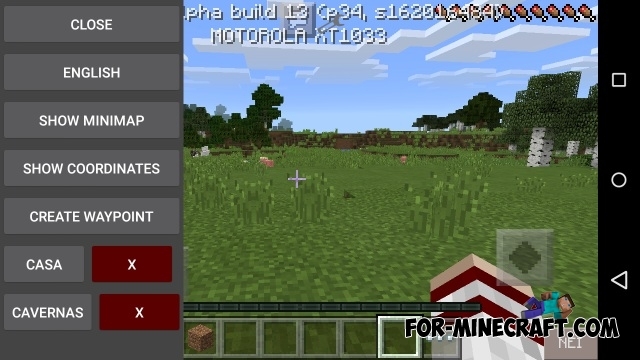 Waypoints mod v.2.1 for Minecraft Pocket Edition 0.10.5Incredibly cool mod that will help you not to get lost if you leave somewhere out of the house. This says you can teleport with this mod. NOT TRUE! Only shows compass arrow back to waypoint.